So, what is the White House portrait of President Abraham Lincoln doing in an east Pasadena blog? Answer: Artist William F. Cogswell was an east Pasadena pioneer and founded the world-renowned Sierra Madre Villa Hotel. He was also a noted portrait artist. The best known of his works is this 1864 portrait of President Abraham Lincoln that is part of the White House Collection. Cogswell is a fascinating guy. A self-made painter, he painted portraits of many of the most prominent men and women of his era. Then, seemingly at the peak of his fame, he left the east coast for a California adventure. Here is some of his story. Born in upstate New York in 1819, Cogswell’s gifts were evident early and, even as a child, he reportedly loved art and color. As a young man, he worked briefly as a color mixer at a Buffalo paint factory. From the paint factory, he moved to New York City where he started his career as a professional painter. But, as the Pasadena Evening Star reported in Cogswell's obituary, the artist "never received a lesson in his life." He was entirely self-taught, which made his accomplishments all the more amazing. Cogswell had a spirit for adventure and travelled extensively. In 1849 he came to California as part of the gold rush. For a year, Cogswell painted gold rush scenes. He then returned east traveling over the Isthmus of Panama. He created large dioramas of gold rush scenes and of Panama which he exhibited on the east coast. His big break came in 1864 when he was invited to the White House to make sketches of President Lincoln. Cogswell then used the sketches and possibly a photograph of Lincoln to create his famous Lincoln portrait. The painting shows Lincoln on the White House porch with the Capitol dome in the background and the President’s black coat and tall hat on the chair in the foreground. As Cogswell finished his work, Congress issued a call for artists to submit portraits of Lincoln and appropriated $3,000 to be awarded to the winning artist. Cogswell submitted his portrait and won the competition. 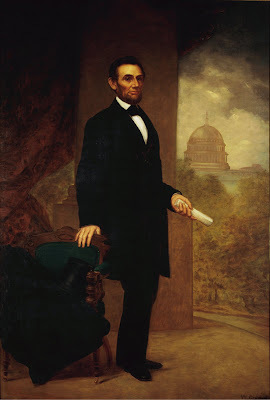 The Lincoln portrait became part of the White House collection where it remains today. In 1868, Cogswell painted a portrait of General Ulysses S. Grant which is now part of the collection of the United States Senate. Grant dabbled with water colors and it is not hard to imagine that he and the talented Cogswell may have struck up a friendship. Cogswell is said to have been a Grant family favorite and painted a life sized portrait of the entire Grant family. Though well established on the east coast, at the age of 54, Cogswell again moved west. In 1873 he purchased 473 acres of wild mesa land in what is now east Pasadena. In its natural state, this land was said to be covered with greasewood so thick a jack rabbit couldn't penetrate it. But, the mesa offered unimpeded views that likely captured the artist's eye and imagination. There was the waiting San Gabriel Valley below and an ocean view that took in Catalina Island and steamers making their way to San Pedro. 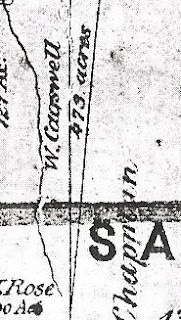 To the left is part of an 1877 L A County map that shows the outlines of Cogswell’s property. I posted a larger section from this 1877 map earlier. The northern edge of Cogswell's property roughly bordered present day Fairpoint St. north of the Eaton Canyon Golf Course. The southern tip of his property extended to present day Foothill Blvd. and Sierra Madre Villa Ave. The jagged western edge of the property tracked the Eaton Wash. Cogswell's purchase also included rights to half the water flow over a waterfall located north of present day Pasadena Glen. With the aid of 70 Chinese laborers, Cogswell's land was cleared and planted with citrus trees and grape vines. Water was transported from the water fall downhill by flume or clay pipe to irrigate the land. A beautiful Victorian home was built on the northern edge of the property. At the suggestion of friends, in 1876, Cogswell and his son-in-law William Porter Rhoades founded the Sierra Madre Villa Hotel on the site. For a brief time, the Villa was the premier winter resort west of the Mississippi. That's a photo of the Villa in the masthead for this blog. I’ll have more on the Villa in later posts. Cogswell continued painting at a prolific rate. He was commissioned to paint portraits of many of the early California governors. His works dot the walls of the state capitol in Sacramento. Cogswell also produced a replica of his Lincoln portrait. He sold the portrait to the State of California and it now hangs in the State Assembly Chambers behind the speaker’s podium. A photo of the portrait is at the Capitol Museum website. Other subjects of Cogswell portraits included: President McKinley, General Sheridan, Supreme Court Justice and Treasury Secretary Saloman Chase, naturalist Louis Agassiz, Mr. and Mrs. Leland Stanford, business titans Mark Hopkins and Jay Cooke. Cogswell also travelled to the Kingdom of Hawaii where he painted the portraits of King Kalakaua and Queen Liliuokalani, the last Hawaiian monarchs. Cogswell died December 24, 1903 at his daughter's home in South Pasadena. Friends I want share with you some A dialogue is a conversation. Writing is a conversation between the writer and the reader. In our case, between the poet and the poetry readers. If you’re publishing your work, don’t pretend you don’t care what other people think of it if they don't seem to understand or like it. Of course you do! You're not going to please everybody all the time, so don't worry about the odd negative comment, but if people aren't responding as you'd like them to, try to see it as an opportunity. Take feedback on board, rewrite and perhaps even send a message to ask someone who has commented to comment again on your latest draft. One of the mistakes it's easy to make is writing about something with implications that seem obvious to you, but are not contained in the poem itself and so are unclear to someone who doesn't know you. Imagine reading it as someone who has no idea whether you’re old or young, male or female, American or Australian, a pupil or a teacher… is it as obvious now? If you want the dialogue you are having with unknown readers to improve, you have to learn to read your own poems from a stranger’s perspective. That is one of the most useful skills in improving your poetry. You can try it with something you’ve written now. Go through line by line from the beginning and try to write down what a stranger would interpret from what you’ve said. The picture will build up through the poem, but it may be that you can identify a place where you’ve assumed they will understand something that is obvious to you, but wouldn’t make sense without some piece of knowledge that you have about your life which is separate from the poem. Michael, I was wondering if you could give me permission to post your article on my family history website - http://wp.me/P2HCbU-4xb. William F. Cogswell is a distant cousin, and I am connected to him that way as well as through his association with Pasadena (I live in Monrovia).